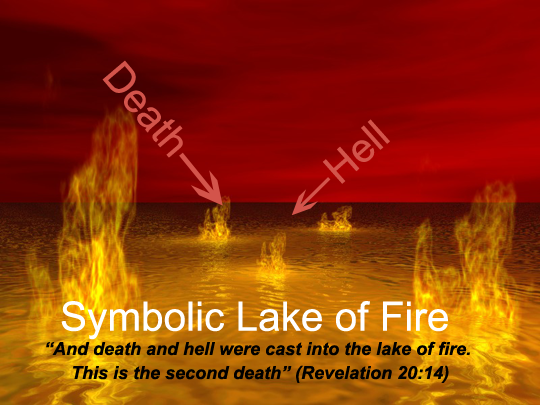 You are at:Home»What is The Lake of Fire? Do visions of persons existing in a fiery place of torment come to mind when you think about The Lake of Fire? Is this a real place? What really is The Lake of Fire, according to the Scriptures? In the preceding paragraph I was careful to state according to the Scriptures because explanation of the Lake of Fire also come from sources other than Scripture. After a close examination of Revelation 20:14, several things should become glaringly clear: (1) That The Lake of Fire is not the same thing as hell. Why is that? Because this Scripture shows that hell is thrown into the Lake of Fire. (2) That the Lake of Fire is The Second Death. What is the Second Death? Once the reader understands what the Second Death is, it should become clear what the Lake of Fire is. The expression, The Second Death, implies something. What? A First Death. A First Death implies something as well. What? A First Life or Birth. All humans have a birth, grow old, get sick, and die. This preceding statement tell us that we all had a First Birth and will have a First Death. This is a fact of life. We were all born and we all die. Verily, verily, I say unto thee, Except a man be born again, he cannot see the kingdom of God. Nicodemus saith unto him, How can a man be born when he is old? can he enter the second time into his mother's womb, and be born? Notice Jesus' mention of born again. What was Jesus talking about here? The promised resurrection. Notice who Jesus said would be resurrected from their graves: ALL PERSONS. If ALL persons are in their graves, then ALL persons would have already died. ALL persons would have already had a First Birth and a First Death. Their resurrection from the dead back to life again is The Second Birth or what many today call being "Born Again." This resurrection will be a resurrection from the First Death to a Second Life or Second Birth. Make no mistake about it, all of us must literally die before we can have a Second Birth (Born Again). This is what Jesus meant when he said "Except a man be born again, he cannot see the kingdom of God." Jesus was telling Nicodemus that it would be impossible for a person to see God's Kingdom unless he first dies and then resurrected back to life again. That is, being Born Again. Anyone who has died has been set free from sin. So when a person is resurrected from the dead, they are resurrected with no sin bound or attached to them. Those sins died when they died. In fact, these were the sins Jesus sacrificed his life for. Therefore, any person who has died (First Time Literally Dying) is resurrected to back to life again (Second Life or Born Again) will have no sin on him, then he is in the proper condition to be able to see God's Kingdom. Each of us had and have a fleshly mother and father. Therefore, we all had a First Birth. All of us will grow old and die. Therefore, we all will die. This is our First Death. According to Jesus at John 5:28-29, ALL persons will have a resurrection from the dead. Therefore, ALL persons will have a Second Birth. Now, we can put all of this together to understand what The Lake of Fire is. Since Revelation 20:14 says that The Lake of Fire is the Second Death, we can now use the Scriptures to identify exactly what it is. Notice that Revelation 20:14 says that both Death and Hell are to be cast into The Lake of Fire. Can death be literally burned? Can hell be literally burned? Did you see that? It says that THERE SHALL BE NO MORE DEATH. If Revelation 20:14 previously stated that DEATH is thrown into The Lake of Fire, what does that mean? It means that The Lake of Fire is a symbol of BEING NO MORE or NON-EXISTENCE or ETERNALLY GONE. And, since hell is also cast into the Lake of Fire, then it too, will BE NO MORE or one day NON-EXISTENT. Notice that death and hell are mentioned together at Revelation 20:14. There is a good reason for this. Because they complement each other. When any person dies, that person enters into hell – THE GRAVE. If DEATH WILL BE NO MORE, then there will be no need for graves. It is unfortunate that the church-systems teach The Lake of Fire as a place of eternal torment. it is equally unfortunate that it also teaches that hell is a place of eternal torment and they often blend in The Lake of Fire and make it their fiery hell. They do not consider what Revelation 20:14 says about hell itself: that it is cast into the Lake of Fire. If The Lake of Fire represents non-existence, then this means that their fiery hell is not eternal; it will become non-existent just as death will. Anyone and anything cast into the Lake of Fire will simply no longer exist. Persons who experience the First Death (all of us) still exist in God's mind as dead persons. Scripture teaches us that Death, Hell, the future Beast, the future False Prophet, anyone not found in the Book of Life, cowards, those without faith, murderers, fornicators, liars, idolaters, and the Devil will one day go into non-existence; The Lake of Fire. This becomes their Second Death. There is no Third Birth after entering into non-existence. Such things as lying, murdering, fornication, faithlessness, idolaters; and such entities as the False Prophet, the Beast and the devil will BE NO MORE. This could be confusing to some because it appears that what I am saying that persons who – for example – are liars now and then they die and later are resurrected with no sin will go into non-existence. No, that is not what I am saying. We must carefully consider the TIME PERIOD in which the lying, murdering, fornication, faithlessness, and so forth will occur. It is not at present; but in the future after the 1000 years have ended. No person up to today has done anything that God will not forgive. Jesus showed this when he asked his heavenly Father to forgive those who persecuted him and put him to death. Since all persons are resurrected from the dead (John 5:28-29) and are resurrected with no sin bound to them, they will enter into a time period lasting 1000 years. During this time period Satan is abyssed. Why? So that he will not be able to interfere with the restoration process we all will undergo during that 1000 years. Entry into that 1000 year period is what Jesus promised a condemned man who also died on the same day as Jesus. That we are Born-Again from the dead (Second Birth) with no sin on us, we will not grow old, get sick and die during that 1000 years on the earth. With Satan out of the way for that 1000 years, he will not be able to influence us to do bad. This future 1000 years will be a wonderful time for all of the human family. But evil will ascend out of the abyss at the end of the 1000 years. For 1000 years, the human family will have learned to be sinless and righteous before it's Creator. Now Satan is re-introduced back onto the earthly scene after the 1000 years. At present – in our First Births – we will not be judged based on anything we do in our First Births. In the future, after we are resurrected (Second Birth) , we will not be judged on anything we do during that 1000 years. During our present existence (First Birth) and future Second Birth (Born Again from the dead) we cannot commit what is called the Unforgivable Sin. It will be different when Satan is released from his prison after the 1000 years. When Satan is unabyssed, and goes out to deceive the nations of people who are existing in their Second Births (been resurrected), we enter into a time period the Scriptures call the Last Days. The Last Days is an unspecified – but short – time period spanning from the time Satan is released from his prison to his destruction. It is within this Last Day period that one can now commit the unforgivable sin. It is at this time that one can enter into the Second Death – a condition from which there is no return. Please do not confuse seeing God's Kingdom with the Coming of God's Kingdom. Jesus had told Nicodemus that "Except a man be born again, he cannot see the kingdom of God." Our resurrection from the dead will only allow us to see or discern God's Kingdom coming, not entering into it. It's coming does not occur until after the 1000 years have ended and the Satan his rebellion and those who joined him are destroyed. revelation Chapter 21. This Last Day time period – which begins with Satan's being released and ending with his destruction – is also called Judgment Day. We are judged based on what we do within this relatively short time period. Again, it is only within this time period that we can commit a sin – make a decision – that will land us into a death that one cannot be resurrected from: The Lake of Fire, The Second Death, Non-Existence. Having already been resurrected, living for 1000 years and restored to the condition Adam was in, we will know what God's requirements are before Satan is released. We will have no excuse for becoming unfaithful to God at that future time and the decisions we make to disobedience to God, we make knowingly and willingly. We cannot say at that time, "The Devil made me do it." So The Lake of Fire is not a literal place. It is a symbol of non-existence. Gehenna in Scripture was a garbage dump. It existed outside the city walls of Jerusalem and the fires were kept burning day and night. So at anytime, a person could throw their refuse over the wall and the fire would consume it and that refuse was gone – nonexistent. Notice that the punishment is Everlasting Destruction – not being punished everlastingly. The period in which wickedness will be assessed and judgment made to Everlasting Destruction (Non-Existence) will be after the 1000 years ends and Satan is released until his destruction. Not one person today has been condemned to The Lake of Fire – The Second Death. This judgment can only be made based on the behaviors and actions of persons within a future time period after the 1000 years. At present, we are all flawed – by inherited sin – and God does not judge or condemn any of us under this condition. Jesus never condemned the sinner in his day. He forgave them. Within our current First Birth states, none of us are to judge another, We are to do just as Jesus did, forgive and not condemn.